The deadly Syrian military conflict – now entering its fifth year – which has claimed the lives of over 200,000 mostly civilians, including women, children and aid workers, has not spared the United Nations either. The world body has been mourning the loss of 17 of its staffers, with an additional 30 missing, probably held in detention either by the Syrian government or by rebel forces battling the government of President Bashar al-Assad. The agency most affected is the U.N. Relief Works Agency (UNRWA), which has lost 14 of its staff, including five of them killed last year. Asked if they were singled out because of their affiliation with the United Nations, Chris Gunness, UNRWA spokesperson and director of advocacy and strategic communications, told IPS the staff killed in Syria died in many different ways “caught up in this pitiless conflict”. He said they were all local Palestinian staff, while the 18,000 civilians trapped in the besieged refugee camp of Yarmouk are a mixture of Palestinian refugees and Syrians. Many Palestinian refugees have been killed or seriously wounded, including in incidents that affected UNRWA installations. “But UNRWA is not in a position to verify figures on the total numbers of Palestinian refugees killed,” said Gunness, on the eve of the third international conference on humanitarian aid to Syria to be hosted by the government of Kuwait. The ongoing civil war in Syria – and the spreading conflicts in Iraq, Libya and Yemen – has made it increasingly difficult for U.N. staffers in humanitarian missions aimed at providing food, medicine and shelter to the ever-growing number of refugees and internally displaced persons (IDPs). At the same time, he said, the U.N. has a policy of “stay and deliver” meaning that it is reluctant to pull out of conflict zones. This means it has a very real duty to protect its staff. While security in the field is taken more seriously than before, the U.N. and its member states could do much more, Richards added. The treatment of local staff is also a worry, he said. The U.N. argues that in contrast to international staff, local staff and their families were already located in the conflict zone. However, by working for the U.N., local staff and their families are seen as a legitimate target, especially by some of the groups operating in Syria. 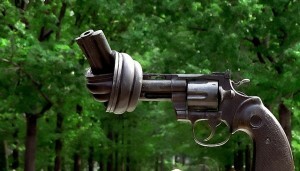 “Therefore the U.N. does need to do more for local staff and their families,” Richards noted. “I am appalled by the number of humanitarian workers and peacekeepers who have been deliberately targeted in the past year, while they were trying to help people in crisis,” he said, at a recent memorial ceremony to honour fallen staff members. In the past year, U.N. staff members were killed while relaxing over dinner in a restaurant in Kabul while two colleagues were targeted after getting off a plane in Somalia, he added. Four out of five Syrians live in poverty, misery and deprivation, he said. And the devastated country, now in its fifth turbulent year of a seemingly never-ending civil war, has lost nearly four decades of human development. A relentless, ruthless war is destroying Syria, the secretary-general continued. “The violence has left so many Syrians without homes, without schools, without hospitals, and without hope,” Ban added. 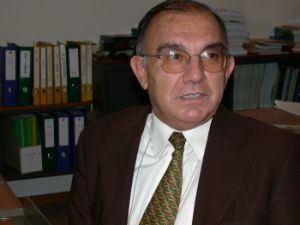 Still, his appeal for a hefty 8.4 billion dollars in humanitarian aid fell short of its target – despite great-hearted efforts by three major donors: the European Commission (EC) and its member states (with a contribution of nearly one billion dollars), the United States (507 million dollars) and Kuwait (500 million dollars). At the end of the day, the third international pledging conference for humanitarian aid to Syria was able to raise only about 3.8 billion dollars against an anticipated 8.4 billion dollars. Without expressing his disappointment, Ban said the kind of commitments made at the conference will make a profound difference to the four million Syrians who have sought refuge in neighbouring countries and the five million still trapped without food or medical help in hard-to-reach besieged areas in the war ravaged country. The U.N. chief also praised the Emir of Kuwait, Sheikh Sabah Al-Ahmad Al-Jaber Al-Sabah, for hosting the pledging conference – for the third consecutive year. The first conference in 2013 generated 1.2 billion dollars in pledges and in 2014 about 2.4 billion dollars – with Kuwait as the major donor at both conferences. In his address, the Emir implicitly criticised the five permanent members of the Security Council – the United States, Britain, France, China and Russia – for their collective failure to bring about a political settlement in Syria. “The international community, and in particular the Security Council, has failed to find a solution that would put an end to this conflict, and spare the blood of our brethren, and maintain the entity of a country, which [has] been injured by the talons of discord and torn apart by the fangs of terrorism,” he added. “While we cannot bring peace, this funding will help humanitarian organisations deliver life-saving food, water, shelter, health services and other relief to millions of people in urgent need,” she added. 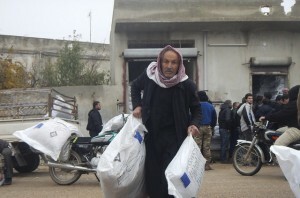 After announcing his pledge, EU Commissioner for Humanitarian Aid and Crisis Management Christos Stylianides said the situation in Syria is worsening every day and it is becoming increasingly difficult for humanitarian organisations to reach those in need. Since the start of the conflict in Syria, more than 11.5 million people have been forced to flee their homes, including 3.9 million who fled to neighbouring countries, and more than 12 million people are in need of urgent humanitarian assistance inside Syria alone – an increase of 30 percent compared to one year ago, he added. The countries where Syrians have sought refuge include Lebanon, Jordan, Iraq, Turkey and Egypt. Andy Baker, Oxfam’s regional programme manager based in Jordan, told IPS the whole exercise “is not a game of numbers” – it involves people’s lives. He said those caught up in the conflict have to make difficult choices: either take a leaking boat to Europe, ask the children to be breadwinners, or arrange early marriages for their daughters. “The ultimate choice for them is to take that leaking boat,” he said. In a “full fair share analysis for funding,” Oxfam has calculated that nearly half the world’s top donors didn’t give their fair share of aid in 2014, based on the size of their economies, including Russia (seven percent), Australia (28 percent), and Japan (29 percent). Governments that gave their fair share and beyond included Kuwait (1,107 percent), United Arab Emirates (391 percent), Norway (254 percent), UK (166 percent), Germany (111 percent) and the U.S. (97 percent). The lead author of a United Nations water report has spoken out about media depictions of his findings, denying the report lays out a “doom and gloom” scenario. The United Nations World Water Development Report 2015, released on Mar. 20 in conjunction with World Water Day, lays out a number of troubling findings. The report predicts a world water shortage of 40 percent by 2050, largely due to a forecasted 55-percent rise in water demand, spurred by increased industrial demands. It is estimated 20 percent of the world’s aquifers are over-exploited, and that shortages may lead to increased local conflicts over access to water. Water problems may also mean increased inequality and barriers to sustainable development. Despite the grim outlook, the report’s lead author, Richard Connor, laid out a different picture at the U.N. headquarters in New York Monday. “Most of the media attention [on the report] has focused on one message, a bit of a doom and gloom message, that there is a looming global water crisis,” Connor told a U.N. press briefing. Connor conceded, “[If] we don’t change how we do things, we will be in trouble,” but found many positives in the report. Much of the report focuses on how institutional and policy frameworks can, and must, protect and promote water security. “The fact is there is enough water available to meet the world’s growing needs, but not without dramatically changing the way water is used, managed and shared,” the report stated. Technology to improve water sanitation, recycling and efficiency is outlined as a major pathway to ensuring water security, to ensure water is used and reused as effectively as possible. Rainwater harvesting, wastewater reuse, and more effective water storage facilities to safeguard against the effects of climate change are also detailed as important areas for investment. On a government level, financing for water projects is also envisioned as a key component in a water secure future. “The benefits of investments in water greatly outweigh the costs,” Connor said. Also speaking at the briefing was Bianca Jimenez, director of hydrology for the United Nations Educational, Scientific and Cultural Organisation (UNESCO). She too called the report “positive,” but stressed that swift action was needed to avoid catastrophic water shortages. “This calls for greater determination from all stakeholders involved, to take responsibility and take initiative in this crucial moment,” Jimenez said. The U.N. is currently reviewing progress made in the implementation of the International Decade of Action ‘Water For Life’, which ran from 2005 to 2015. Concerns over the possibilities of fraud were quietly swept away when the national election commission called the winner of the country’s presidential poll as Muhammadu Buhari of the All Progressives Congress (APC). Buhari edged out his rival by around two million votes. A phone call from the defeated president, Goodluck Jonathan, reached Buhari’s headquarters about five minutes before five with congratulations on the victory. After 35 of the 36 states’ vote totals were tallied, Buhari appeared to have captured 14.9 million votes compared to Jonathan’s 12.8 million. The massive balloting and collection was marred by missteps as the new voter cards failed, sensitive materials were snatched, election officials were held captive, and protestors were tear-gassed. Thousands of ballots were rejected and some polling stations were closed without notice including in major cities such as Lagos. Even before preliminary tallies were recorded, the opposition APC rejected the process in Rivers state and denounced the vote there as “a sham and a charade”. A similar complaint came from Governor Rochas Okorocha of Imo State who complained of soldiers harassing voters, shootings, ballot boxes mishandled, and the arrest of his senior special advisor. “This is the worst act of militarisation of democracy,” the governor said. The new imported biometric machines “largely failed to read voter cards,” commented Kayode Idowu, spokesman for the Independent National Electoral Commission (INEC). Even the president was affected as three machines failed to recognise the fingerprints of Goodluck Jonathan and his wife. Among the citizen photos were two from Rivers state where women are seen in clouds of teargas as they struggled to reach the office of INEC to demand suspension of the electoral commissioner who they claimed was rigging the election for the outgoing president. In southern Akwa Ibom state, citizen journalists captured the governorship candidate from the opposition displaying sheets of ballots discarded allegedly by rogue staff of INEC and officials of the ruling Peoples Democratic Party (PDP). The number of rejected ballots around the country was disturbingly high. Nassarawa, in the nation’s center, registered 10,094 rejected ballots – enough to put either of the candidates way over the top. In the final hours before victory was called, the major contenders – President Jonathan of PDP, seeking re-election, and Muhammadu Buhari of APC, an ex-military man seeking a return to power – were running neck and neck. In addition to the PDP and APC, 13 other parties were vying for the nation’s top job in polls across 36 states and 68 million registered voters. Preliminary reports by the British consulting firm Environmental Resources Management (ERM) revealed the existence of previously unknown species in the area of the new canal that will link the Pacific and Atlantic oceans. 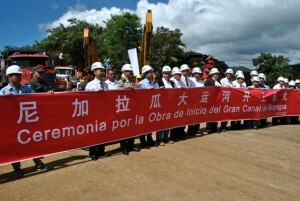 The study was commissioned by Hong Kong Nicaragua Canal Development (HKND Group), the Chinese company building the canal. Among other findings, the study, “Nicaragua’s Grand Canal”, presented Nov. 20 in Nicaragua by Alberto Vega, the consultancy’s representative in the country, found two new species of amphibians in the Punta Gorda river basin along Nicaragua’s southern Caribbean coast. The two new kinds of frogs have not yet been fully studied, said Vega, who also reported 213 newly discovered archaeological sites, and provided an assessment of the state of the environment along the future canal route. The aim of the study was to document the main biological communities along the route and in adjacent areas, and to indicate the species and habitats in need of specific conservation measures in order to identify opportunities to prevent, mitigate and/or compensate for the canal’s potential impacts. The 278-km waterway, which includes a 105-km stretch across Lake Cocibolca, will be up to 520 metres wide and 30 metres deep. Work began in December 2014 and the canal is expected to be completed by late 2019, at a cost of over 50 billion dollars. The environmental impact study will be ready in late April, Telémaco Talavera, the spokesman for the presidential Nicaraguan Grand Interoceanic Canal Commission, told Tierramérica. 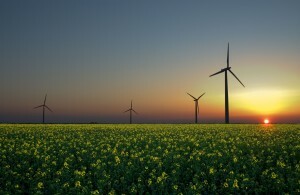 “The studies are carried out with cutting-edge technology by an international firm that is a leader in this area, ERM, with a team of experts from around the world who were hired to provide an exhaustive report on the environmental impact and the mitigation measures,” he said. Víctor Campos, assistant director of the Humboldt Centre, told Tierramérica that HKND’s preliminary documents reveal that the canal will cause serious damage to the environment and poses a particular threat to Lake Cocibolca. The 8,624-sq-km lake is the second biggest source of freshwater in Latin America, after Venezuela’s Lake Maracaibo. 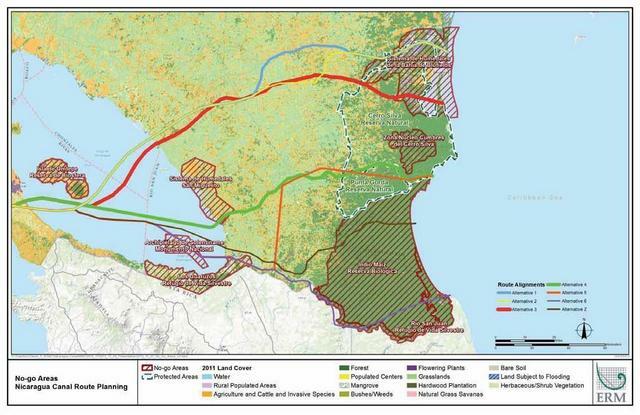 Campos pointed out that HKND itself has recognised that the route that was finally chosen for the canal will affect internationally protected nature reserves home to at least 40 endangered species of birds, mammals, reptiles and amphibians. The route will impact part of the Cerro Silva Nature Reserve and the Indio Maiz biological reserve, both of which form part of the Mesoamerican Biological Corridor (CBM), where there are endangered species like scarlet and great green macaws, golden eagles, tapirs, jaguars, spider monkeys, anteaters and black lizards. Along with the Bosawas and Wawashan reserves, Indio Maíz and Cerro Silva host 13 percent of the world’s biodiversity and approximately 90 percent of the country’s flora and fauna. This tropical Central American country of 6.1 million people has Pacific and Caribbean coastlines and 130,000 sq km of lowlands, plains and lakes. There have been several previous attempts to use Lake Cocibolca to create a trade route between the two oceans. The Cocibolca Group, made up of a dozen environmental organisations in Nicaragua, has warned of potential damage by excavation on indigenous land in the CBM, on the country’s southeast Caribbean coast. One site that would be affected is Booby Cay, surrounded by coral reefs and recognised by Birdlife International as an important natural habitat of birds, sea turtles and fish. Studies by the Cocibolca Group say that dredging with heavy machinery, the construction of ports, the removal of thousands of tons of sediment from the lake bottom, and the use of explosives to blast through rock would have an impact on the habitat of sea turtles that nest on Nicaragua’s southwest Pacific coast. 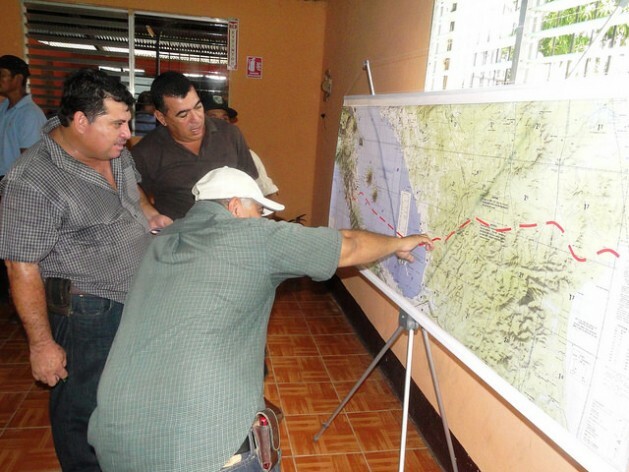 The selected route, the fourth of the six that were considered, will run into the Pacific at Brito, 130 km west of Managua. A deepwater port will be built where there is now a beach that serves as a nesting ground for sea turtles. The route will run through nature reserves, areas included on the Ramsar Convention list of wetlands of international importance, United Nations Educational, Scientific and Cultural Organisation (UNESCO) biosphere reserves, and water basins. The canal is opposed by environmental organisations and affected communities, some of which have filed a complaint with the Inter-american Commission on Human Rights (IACHR). In an IACHR hearing on Mar. 16, Mónica López, an activist with the Cocibolca Group, complained that Nicaragua had granted HKND control over the lake and its surrounding areas, including 16 watersheds and 15 protected areas, where 25 percent of the country’s rainforest is concentrated. The state also gives up the right to sue the investors in national or international courts for any damage caused to the environment during the study, construction and operation of the waterway. In the IACHR hearing in Washington, representatives of the government, as well as Talavera, rejected the allegations of the environmentalists, which they blamed on “political interests” while arguing that the project is “environmentally friendly”. They also repeated the main argument for the construction of the canal: that it will give a major boost to economic growth and will enable Nicaragua, where 42 percent of the population is poor, to leave behind its status as the second-poorest country in the hemisphere, after Haiti. 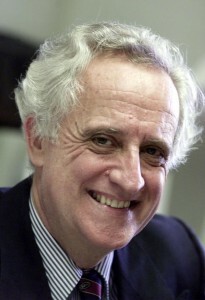 In this column, Joaquín Roy, Jean Monnet Professor of European Integration and Director of the European Union Centre at the University of Miami, looks at the geopolitical context within which the normalisation of relations between the European Union and Cuba is likely to place following the recent visit to Cuba of the Representative for Foreign Affairs of the European Union, Federica Mogherini, and the scheduled visit of French President François Hollande in May. The sudden announcement of normalisation of diplomatic ties between the United States and Cuba in December last year set the context for the rapprochement between Brussels and Havana. At the time, negotiations were already under way on a bilateral ‘Political Dialogue and Cooperation Agreement’; after years of confrontation, the European Union was prepared to abandon the “common position” imposed by Brussels on the Fidel Castro regime in 1996. While Washington’s stance was that the persistence of a strictly Marxist regime deserved the imposition of conditions for ending its embargo, the European Union and a consensus of its governments held to the policy of so-called “constructive engagement”. EU member states continued to relate to Cuba on an individual basis according to their special historical links, economic interests and a range of views on human rights. After a number of tensions were overcome, in 2014 Brussels decided to adopt a pragmatic programme that would lead to a cooperation agreement similar to those signed between the European Union and every other country and bloc in Latin America and the Caribbean. The process even came to be sarcastically called a “Hispanic-Spanish issue”. In this context, a number of European states behaved according to their own convenience, with no essential change in the overall scenario. Cuba avoided dealing with the broader European community, opting instead a for country-by-country approach. But the world was changing, and the real value of Europe’s stock in Cuba fell. Then it was the right time for Brussels to seize the day and take advantage of the circumstances to negotiate with Cuba, with an open agenda that would include dismantling the “common position”. After discrete exchanges, both sides decided to sit down for talks. Surprisingly, Cuba was open to a process without which the common position would be eliminated, as had been its strong traditional demand. Spain itself was facing a delicate internal situation and needed to seek stability on other fronts. Consolidation of its relations with Latin America depended on juggling the claims and expectations of different domestic ideological groupings. Moreover, the vote of the Latin American bloc was vitally important for Spain’s candidature to the U.N. Security Council, a consideration that counselled extreme caution on the part of Madrid. In the new era, it is hard to predict what role Spain will play in the Cuban transition, but in principle it has remarkable potential, and not just because of the weight of history and the contemporary importance of the “special relationship” between the two countries. It is relevant to note that U.S. influence on Cuba’s own national identity has not been limited to imposing its hegemonic power. A hefty dose of the “American way of life” has become an essential part of the Cuban being. The “enemy” was never the United States per se, but its concrete policies of harassment. The ease with which Cuban exiles of different epochs and different social backgrounds fit into U.S. society shows the naturalness of this curious relationship. Normalisation of relations will help reinforce the link. European interests would do well to take note because the rebirth of the natural relationship between the United States and Cuba will provide strong competition to the relative advantage that European interests have so far achieved, and could significantly reduce it. The outcome of competition from U.S. economic and political power in Cuba vis-á-vis renewed European operations will depend to a large extent on the nature and intensity of Washington’s renewed involvement with the island. Europe could maintain its relative advantage if the Cuban authorities themselves, or the surviving embargo restrictions, however moderated, set limits to U.S. activity. It is worth emphasising that European activities in Cuba will continue to be limited, within E.U. institutional structures as well as on the pragmatic agendas of its member countries, as long as the U.S. embargo lasts. Restrictions on trade and investments continue to affect full freedom of movement by European companies in Cuba itself, as well as their transnational alliances in the rest of the world where U.S. interests are dominant. As a result, even in a relatively open relationship, the real possibilities for a European advantage remain largely speculative, and may even decline, especially in the area of trade and investments. Recent research shows that only 125 million women of a working age are currently employed, with the number of women in the workforce declining steadily since 2004. Experts say these figures should serve as a wake-up call for Asia’s third largest economy, adding that unless this nation of 1.2 billion people begins to provide equal opportunities for women, it will miss out on vital development and poverty-reduction goals. According to a report released earlier this month by the International Monetary Fund (IMF), India’s female labour force participation (FLFP) rate is amongst the lowest among emerging markets and peer countries. India’s FLFP – the share of employed women or job seekers among the working-age female population — is 33 percent, almost half of the East Asian average of 63 percent and well below the global average of around 50 percent. The IMF’s findings amplify what has been already been identified as a disconcerting trend in India lately – the absence of a diverse and inclusive workforce. A debate is currently raging across the country about the skewed gender balance in Indian corporate boardrooms where women hold barely five percent of seats – lower than all the other countries that comprise the BRICS group of emerging economies (Brazil, Russia, India, China and South Africa). A progressive new law was passed in 2013 that requires all companies listed on the national stock exchange to have at least one female board member by August 2014. However, the deadline had to be extended to April 2015 as only a few companies came forward to appoint women to these top positions. The lack of women workers in India is a “huge missed opportunity” for the country’s economic growth, lamented IMF Managing Director Christine Lagarde on a recent trip to this country of 1.2 billion people. Gender diversity in the workplace isn’t just about political correctness; it is an economic imperative, economists say. A study undertaken by the International Labour Organisation (ILO) in 2013 proves that India’s growth has been stunted by women’s exclusion from the workforce. “Assuming the gender gap is halved by 2017 and cut to one-fourth of its 2008 value in 2027, India’s per capita income could be 10-13 percent higher than under the baseline scenario of unchanged gender inequality in 2020 and 2030, respectively,” the report stated. Some say the primary explanation for the apparent ‘absence’ of working women is a dearth of national-level data on the informal sector. Since a majority of women perform mostly unpaid, domestic labour on a regular basis, their contribution to the economy does not ‘count’ when the country tallies up its records of the formal labour market. “A woman’s work in her own household is not counted as an economic activity, and does not get factored into the national income statistics,” explains Preet Rustagi, joint director of the Institute for Human Development in New Delhi. Rustagi tells IPS that this is unfortunate, as women’s domestic duties in India cover a range of responsibilities like cooking, caring for the elderly, and rearing children, all work that is crucial to the economy and all of Indian society. In the villages, women additionally engage in the vital task of animal husbandry, which is also excluded from enumeration, elaborates Rustagi. Cultural norms also scupper women’s entry into the formal workforce, say analysts. “The entrenched Indian patriarchal culture idealises women in, and restrict them to, the roles of housewives and mothers. Notions of socio-ritual superiority of a group or family can be directly linked to higher restrictions on women including their physical mobility and work outside homes,” explains Bhim Reddy, associate editor of the Indian Journal of Human Development who has researched extensively on recruitment practices in labour markets. Reddy adds that a higher school enrolment rate, especially for women between the ages of 14 and 21, has also contributed to an asymmetrical workforce. “A large section of females in this age group that used to be part of the work force earlier is now in schools and colleges, and this is getting reflected in a drop in the female LFPR,” elaborates Reddy. But research by Everstone Capital, an investment management company, shows that while the number of women enrolling in college has grown manifold, it has not translated into a proportionate increase of women graduates in the workforce. At 22 percent, the rate of India’s female graduates entering the workforce is lower than the rate of illiterate women finding jobs. Worse, participation of Indian women in the workforce plummeted from 33.7 percent in 1991 to 27 percent in 2012, according to United Nations statistics. In 2011-12, less than 20 percent of the total workers in non-agricultural sectors was women. Surprisingly, female labour participation has been found to be particularly low even among urban, educated women — a demographic typically assumed to experience fewer social barriers. 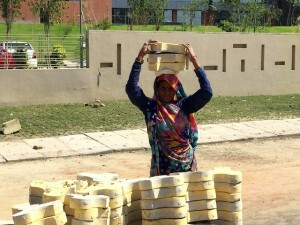 According to government statistics, in 2009-10, the proportion of those attending to domestic duties (and therefore out of the formal labour force) was 57 percent among urban females with graduate degrees or higher, compared to just 31 percent among rural females with primary or middle school education. Experts say the advent of mechanisation and incorporation of new technologies in agriculture and the construction industry have led to the ‘masculinisation’ (or preference for males for a certain job profile) of employment patterns. Exploitation and harassment in the workplace have worsened the situation. India passed a new law against sexual harassment last year, under which organisations with more than 10 workers have to set up grievance committees to investigate all complaints. However, according to a study by Jawaharlal Nehru University, less than 20 percent of employers in the capital, New Delhi, comply with the rules. Household surveys show that a more welcoming environment would compel many stay-at-home women to take on regular work. At present, issues of transport, workplace safety and hostile attitudes result in many women opting out of full-time employment. Apart from sensitisation campaigns, activists advocate greater investments in infrastructure, safe public transportation, better childcare facilities at work and tax breaks to lure Indian women into the workforce. “It is imperative to acknowledge that we have a crisis at hand, and we then work towards female empowerment to help India realise its full economic potential,” says Rustagi.